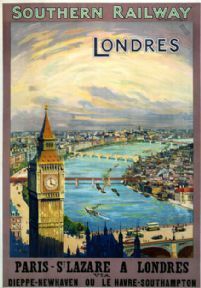 Southern Railway poster promoting rail services between Paris St Lazare to London via Dieppe-Newhaven or Le Havre-Southampton. View of the River Thames with Big Ben in the foreground. 1923-1947. Skegness is So Bracing, It's quicker by Rail. English Railway Travel Poster Art Print.